FILE PHOTO: Saudi Energy Minister Khalid al-Falih attends a session of the St. Petersburg International Economic Forum (SPIEF), Russia, June 2, 2017. MOSCOW - Agreements reached between Russia and Saudi Arabia on global oil supply have helped oil markets to stabilize, Saudi Energy Minister Khalid al-Falih said on Thursday. The two countries, the world’s biggest producers of crude, helped secure a deal between OPEC and rivals including Russia to cut supplies until the end of March 2018 in an effort to reduce a price-sapping glut. Falih, whose country is the de facto leader of the 14-member Organization of the Petroleum Exporting Countries, also said he welcomed the contribution of U.S. shale oil supplies as global demand for crude was on the rise. “Shale coming in and happening again in 2018 doesn’t bother me at all. 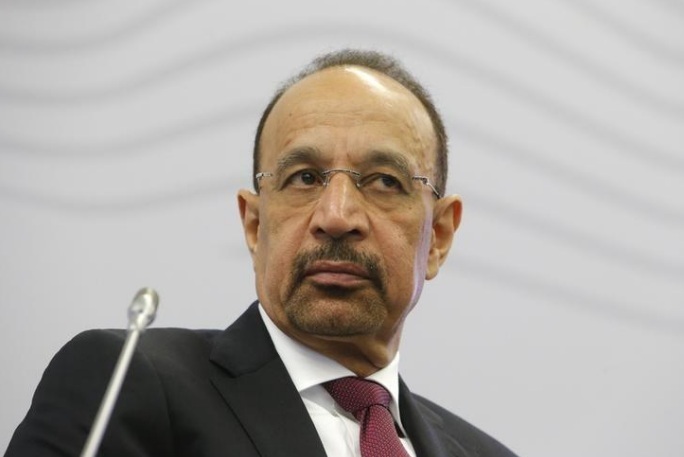 The market can absorb it,” Falih said, speaking alongside Russian Energy Minister Alexander Novak as part of a panel discussion at an energy forum in Moscow. The comments came a day after Russian President Vladimir Putin said the supply-cutting deal could be extended to the end of 2018, a longer timeframe than others have suggested. Novak said Moscow would support the possible participation of additional countries in the output deal, and that he was satisfied with current oil prices. Oil steadied around $56 a barrel on Thursday on expectations that Saudi Arabia and Russia would extend production cuts. Falih said Saudi Arabia wants to develop ties with Russia further, particularly in the private sector. “I see huge opportunities in front of our countries and for the business sector in both nations,” Falih said. The visit of Saudi Arabia’s King Salman to Russia this week shows the high degree of mutual trust between Russia and Saudi Arabia, Falih said. King Salman is in Russia as part of a state visit, the first to Moscow by a reigning Saudi monarch. A slew of investment agreements are due to be signed during King Salman’s trip and plans for a $1 billion fund to invest in energy projects are likely to be finalised, as part of efforts to expand cooperation. “This historic visit will witness the signing of memoranda of understanding (MoUs) in several fields that are important to both countries,” Falih said. He said MoUs would be signed with Russia’s state nuclear agency Rosatom for the peaceful use of nuclear energy as well as other agreements for military industries and marine development. State oil giant Saudi Aramco will sign several non-binding MoUs on Thursday with Russian companies Gazprom, Gazprom Neft, Sibur and Litasco. The Russian Direct Investment Fund will also sign an MoU with Aramco and Saudi’s Public Investment Fund for investments in energy services and manufacturing. Saudi Aramco is discussing several investment opportunities with Russian firms, Aramco Chief Executive Amin Nasser told reporters earlier on Thursday in Moscow. Nasser told the Arabiya television channel in Moscow that he sees the oil market stabilizing as demand growth continues and global oil inventories decline. Agreements reached between Russia and Saudi Arabia on global oil supply have helped oil markets to stabilize, Saudi Energy Minister Khalid al-Falih said on Thursday.